When talking about dams, the mind usually conjures up surface dams (see sheet E 7). Sub-surface dams are also used to provide access to water. When the surface water is insufficient or even non-existent, of poor quality or too far away, they can capture groundwaters flowing fairly near the surface of the ground, either in valleys or in dry water course beds. This water can be accessed via wells upstream from the dam and surrounded preferably by gravel infiltration galleries. This is an ancient method fairly widespread worldwide. It is used by many local authorities, village communities and NGOs. Constructing a sub-surface dam can create reserves of better quality water than from surface water reservoirs. It is not contaminated by the population, nor by animals or pests. It requires tremendous manpower and many hours of work but this is often free or with modest remuneration by the population in question as the technique is simple. Inhabitants of rural areas or valleys are mainly involved as they can build up water reserves for both domestic use and crops. First and foremost, it is important to choose its position well using suitable methods as indicated below or even better by asking a specialist for his opinion. Considerable expanses of vegetation will already tell you, however, whether or not there is a dry water course in the bed or along the banks as they indicate water nearby. There are three main types of sub-surface dams. They depend mainly on the materials used - clay, masonry or sand. Nevertheless, some dams have been constructed using the cut produced during the excavation as an addition. A trench must firstly be dug and a wall constructed in all circumstances. When digging the trench, the sand must be removed and placed upstream so that the people digging do not need to move it should the surrounding sand collapse into the hole. Sub-surface dams must be built during the dry season when the groundwater currents are at their lowest level. Sand dams must be built over several dry seasons. Water can flow into the trench when constructing clay or masonry sub-surface dams. It can then be removed quickly with a siphon, a pump or a bucket and can also be used to mix mortar and its hardening. Made up of a clay wall, it must be constructed during the same dry season where the river is at its most narrow and the least sandy. A trench is dug first then the clay wall is gradually raised. One of the main difficulties is to make sure that the dam is impermeable and therefore to choose and compact the clay carefully. It is important therefore to prevent the water from infiltrating through leaks or fractures, especially above the dam. The dam must be wide enough (about 2 m) over its entire height. The top of the dam must be protected against erosion from the force of the current, which is done by spreading a layer of large stones about 50 cm deep along the entire crest. The dam must be extended with compacted clay as far as the edges of the river to avoid leaks and erosion between the river banks and the dyke. This can once more be avoided by setting large stones on the banks, both upstream and downstream, with sand and small stones between them. It is also important to ensure that no sand remains in the trench to avoid leaks underneath the dam. Leaving sand behind risks water leaking under the wall. This type of dam is also built in one season where there is impermeable rock that can act as substrate. It is less wide (about 50 cm) and more solid but more expensive. The masonry walls are normally built to at least 50 cm above the river bed. As in the previous case, it is placed downstream from a well. Building a foundation prevents water infiltrating under the dyke. 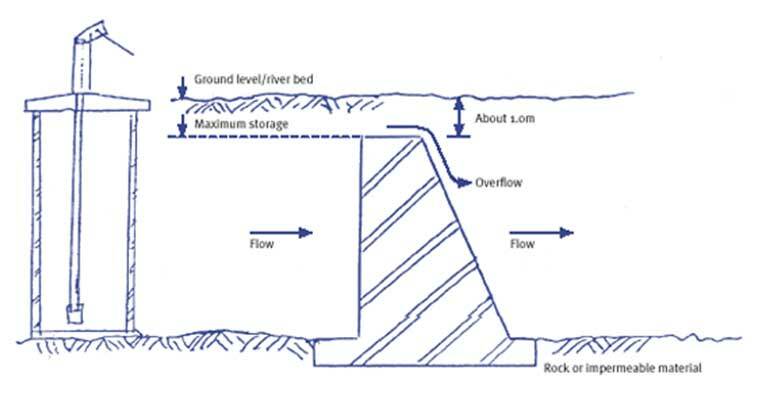 It is important to plan for an overspill apron to evacuate the excess water to protect the downstream side of the dyke from the erosion caused by the flow of the water. As in the previous case, the dam must be extended by two walls as far as the river bank to avoid leaks between the banks. As in the previous case, the crest of the dam and the side walls must be protected against erosion by large stones, with sand and small stones inserted between them. When preparing the foundation, it is important to check that no sandy materials or permeable rocks are left at the bottom of the trench in the rocky substrate layer. This is the most frequent type of dam. During the rainy or flood season, the river currents carry huge amounts of sand and deposits. Some of them cluster together on the bank or the rocky walls and can help to create water reserves. 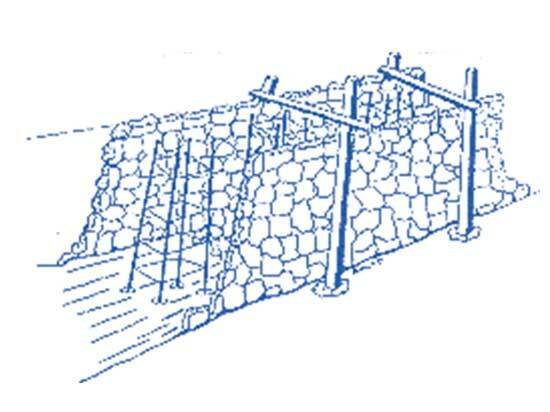 Building this type of dam is inspired by this natural process by trapping the sand and gravel which is displaced by the water courses or rivers during the spates at a suitable position. This dam cannot be built in one operation, unlike the other types, and must be constructed gradually in phases over the seasons to a height of about 50 cm. 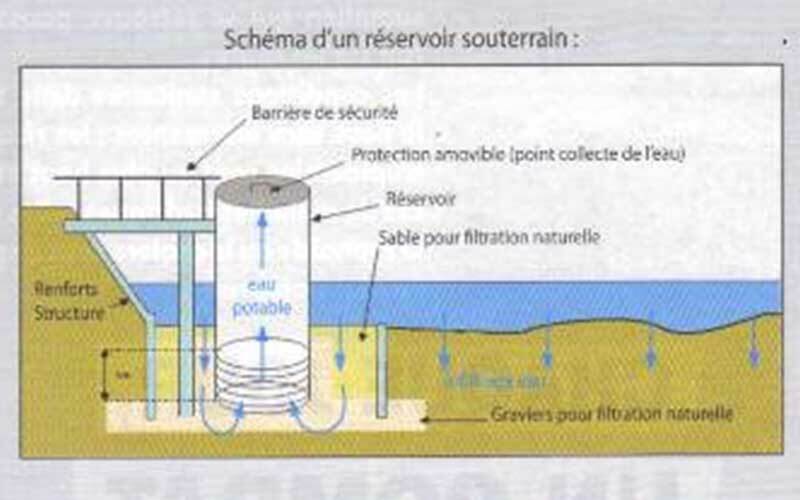 There is no need to construct a well (but this can be done if necessary) as a filtration chamber and a pipe through the base of the dam collects the stored water. It is not as strong as a masonry dam but it costs less. The dam foundation is constructed in similar fashion as for the masonry dams. The first layer of the sand wall must not be more than about 50 cm high. The height of the wall must not be raised as long as the sand deposited by the river floods has not reached the previous height. The sides of the wall can be strengthened. During this first stage, a filtration chamber is built in the bottom section of the wall that is connected to a sloping pipe passing through the dam from one side to the other. The water can then be collected downstream through simple gravity via a tap or the arrangement of a small recovery station, a small irrigation system, a watering place for animals or laundry basins. After the first and following phases, remember to place large stones on the downstream side of the dam and on the edges both sides to prevent erosion. Masonry walls about 30 cm thick should also be built on the edges when the main wall has reached its maximum height of no more than 5 m.
Every time the structure is extended, it is preferable to only add a maximum of 50 cm to the height of the dam wall. The main difficulty lies in being able to estimate at least approximately the shape and capacity of the water reserve that can be used, which should be done however before work starts. 1. As the reservoir layer is "in the basement", it is difficult to lay it accurately. 2. The reserve capacity depends on the effective porosity of geological formations of the future reservoir, which requires major investigations. 3. The ability to reconstitute the water reserve is also difficult to estimate. 4. There may be leaks. This suggests the advisability of asking a specialist for his opinion, especially if a large dam is involved. 1. No land is submerged and therefore nature is not altered in any way nor are populations displaced. 2. There are no losses through evaporation. 4. It is stable and requires little maintenance. Any damage is far more limited and there are fairly few repercussions downstream. 5. The excess sand deposits can be sold and bring in a little income. 6. The effects on the river downstream are very limited. 2. Dam not as effective due to the porosity of soils as the water accumulates in the interstices. 3. Possibility of unexpected water influx during the work. 4. Need for major excavation and fill work if installed fairly deep. 5. More difficult to construct. It is difficult to give costs as they depend too much on local characteristics and conditions. One example is however given a little further on for a dam built in Somalia (€8,300). Maintenance costs are low as it takes less than a week’s work per year. - latrines must not be built upstream of the dam for at least 300 m.
- animals must not be allowed nearby (better to plan for a watering place if necessary). - the use of pesticides or chemicals must be forbidden upstream of the dam. For clay sub-surface dams, the dam site must be inspected after each major flood to check that there is no erosion. If so, the wall must be repaired or rebuilt and protected once more with even heavier large stones. For masonry sub-surface dams, any erosion caused by the currents and likely to damage the dyke must be halted by filling the dyke with large stones. For protruding sand dams, the gravity pipe must be checked often for signs of damage or leaks. Lastly, it can prove necessary to monitor the level of the reserve ; a piezometer, g, can be installed for this purpose and how much water and how fairly it is shared between users can be checked. The NGO Solidarités International recently created fourteen sub-surface reservoirs with the very active participation of ten communities in the Afmadow region in Somalia. They were constructed according to the diagram opposite and gave access to drinking water to nearly 96,000 people. There was in fact no other sustainable and economically acceptable solution in this region that only had four water points for 90 sq. km. As the majority of the work was done by the populations involved, it cost an average €8,300 for these sub-surface reserves, i.e. €1.21 per beneficiary. 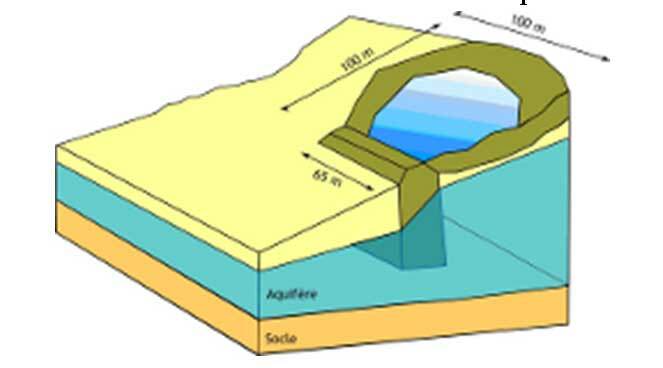 - IOWater (International Office for Water) with access to different sites like Réseau RéFEA (Centre télématique francophone sur l’eau) where several short and precise practical sheets can be found. They have in fact been the inspiration for this sheet. * Sub-surface dams. This fairly long video in English only was shot in Andhra Pradesh in India for training sessions on building sub-surface dams. Interesting but fairly difficult to understand. - Kitui Sand dams, a 15’ video from Arena films with English sub-titles showing the construction, with the very active participation of the population, of sand dams (programme of 450 dams by the NGO SASOL in Kenya for an average price of €30 per person). Another, wider programme covers the miscellaneous methods of water recovery, including dams.